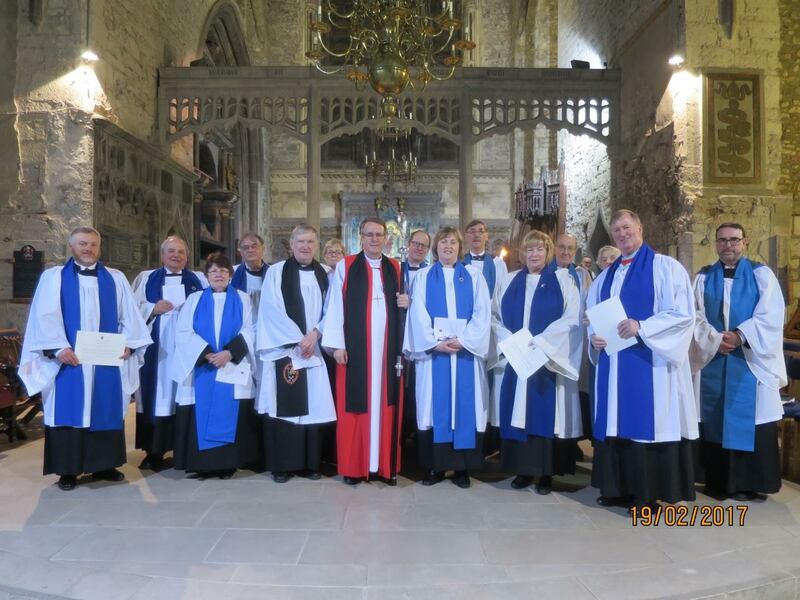 Choral Evensong in St Mary’s Cathedral, Limerick on Sunday 19th February 2017 marked three joyful events in the life of the United Dioceses of Limerick & Killaloe. 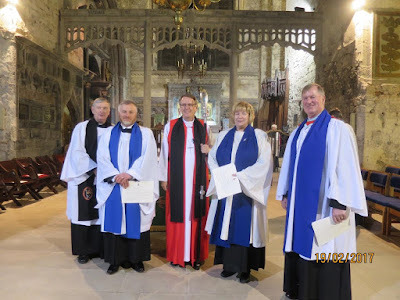 Firstly, Bishop Kenneth launched the new Guild of Lay Readers, chaired by Audrey Clarke Gordon of Nenagh Union of Parishes, in a ceremony in which existing diocesan readers recommitted themselves to the work for which they were commissioned. Secondly, Bishop Kenneth commissioned there diocesan readers for work in Limerick & Killaloe: Mrs Norma-Jean Carney (Birr Group of Parishes)and Jerome Phair (Clonfert Group of Parishes) were newly commissioned after successfully completing the Certificate in Christian Studies programme run in the Diocese of Cashel, Ferns & Ossry; and Dr Steven Ellis, already a diocesan reader in the Diocese of Tum, Killala & Achonry, was also commissioned for Limerick & Killaloe, where he often serves. And thirdly, Rev Patrick Comerford, Priest-in-Charge of Rathkeale & Kilnaughtin, was installed as Canon Precentor of the Joint Chapter of St Mary’s Cathedral, Limerick, St Flannan’s Cathedral, Killaloe and St Brendan’s Cathedral, Clonfert. 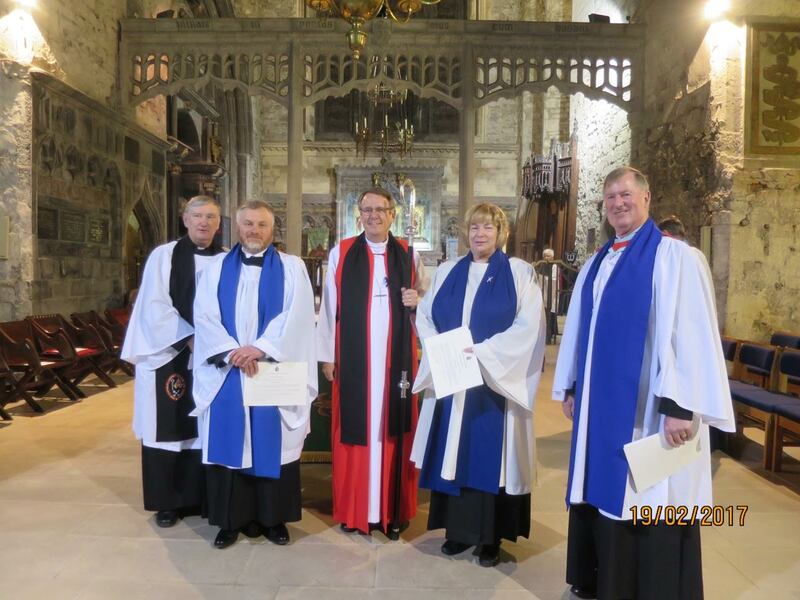 Diocesan reader Jackie McNair, Chaplain at Villiers School, led the service beautifully. 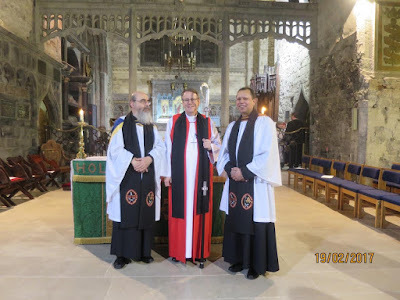 The guest preacher, Rt Rev Patrick Rooke, Bishop of Tuam, Killala & Achonry, reflected eloquently on the importance of the ministry and witness of lay readers, and of the educational role that Canon Patrick Comerford will shortly take up. He touched on the turbulent times we live in. In a turbulent world he urged readers in their ministries to be “wise friends”, a source of insight and discernment from a distant centre, but close both to parish clergy and to the people they serve. The choir of St Mary’s Cathedral, under the direction of Pater Barley, did full justice to Magnificat and Nunc Dimittis by Harwood in A flat and the anthem Expectans expectavi by Charles Wood – fine singing does so much to bring worship to life. Last night in the Rectory in Askeatro, we began a series of Monday evening Lenten studies, with parishioners joining me in discussing the Bible readings set out in Bishop Kenneth Kearon’s Lenten Challenge to the Diocese of Limerick and Killaloe. Christ calls us to actively engage in our world (see article). Pray for the Revd S Balasundram in Sri Lanka – and Christians around the world – in our efforts to be salt and light in society.